A TO Z MINI BILLBOARDS AD NETWORK Provides advertisers with targeted hard to reach locations and experiential marketing solutions that efficiently deliver. 1 A TO Z MINI BILLBOARDS AD NETWORK Provides advertisers with targeted hard to reach locations and experiential marketing solutions that efficiently deliver distinct demographic and psychographic niches with the added benefit of shared profits and residual income for life. 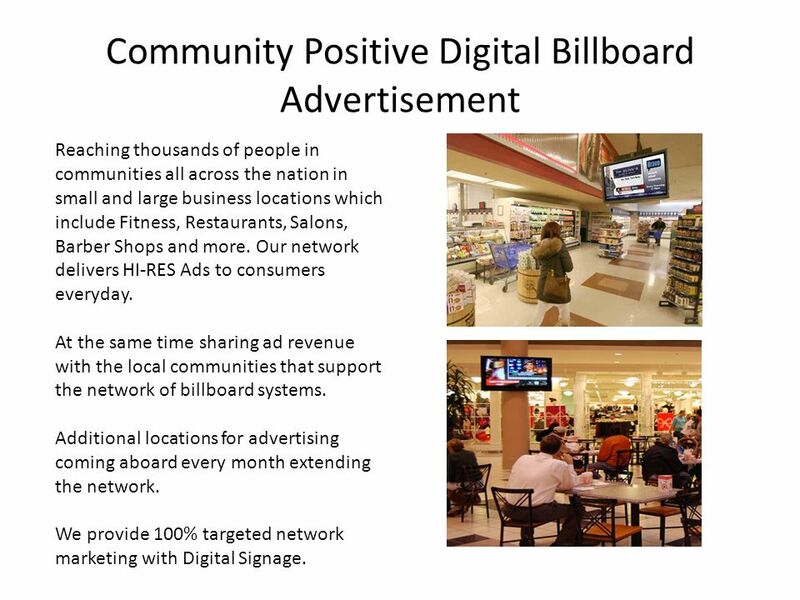 2 Community Positive Digital Billboard Advertisement Reaching thousands of people in communities all across the nation in small and large business locations which include Fitness, Restaurants, Salons, Barber Shops and more. Our network delivers HI-RES Ads to consumers everyday. At the same time sharing ad revenue with the local communities that support the network of billboard systems. Additional locations for advertising coming aboard every month extending the network. We provide 100% targeted network marketing with Digital Signage. 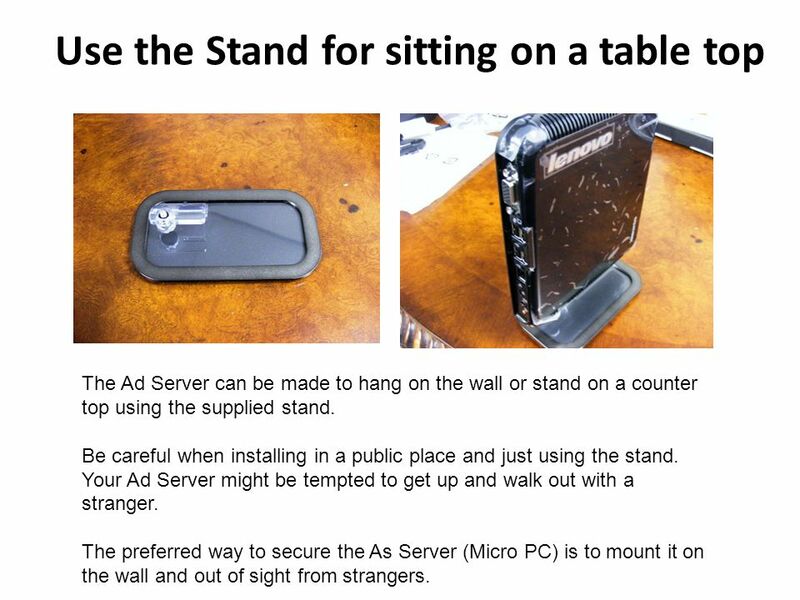 6 Use the Stand for sitting on a table top The Ad Server can be made to hang on the wall or stand on a counter top using the supplied stand. Be careful when installing in a public place and just using the stand. Your Ad Server might be tempted to get up and walk out with a stranger. The preferred way to secure the As Server (Micro PC) is to mount it on the wall and out of sight from strangers. 7 Mounting the Ad Server on the Wall Find a location near your Video Display to mount the Ad Server so there will be no cables showing when the system is connected finally. 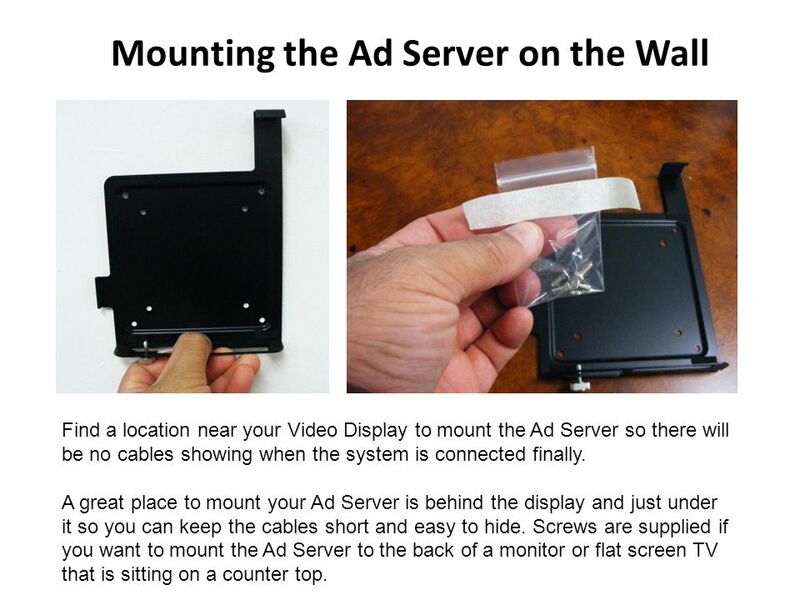 A great place to mount your Ad Server is behind the display and just under it so you can keep the cables short and easy to hide. Screws are supplied if you want to mount the Ad Server to the back of a monitor or flat screen TV that is sitting on a counter top. 8 Power up and your in business! 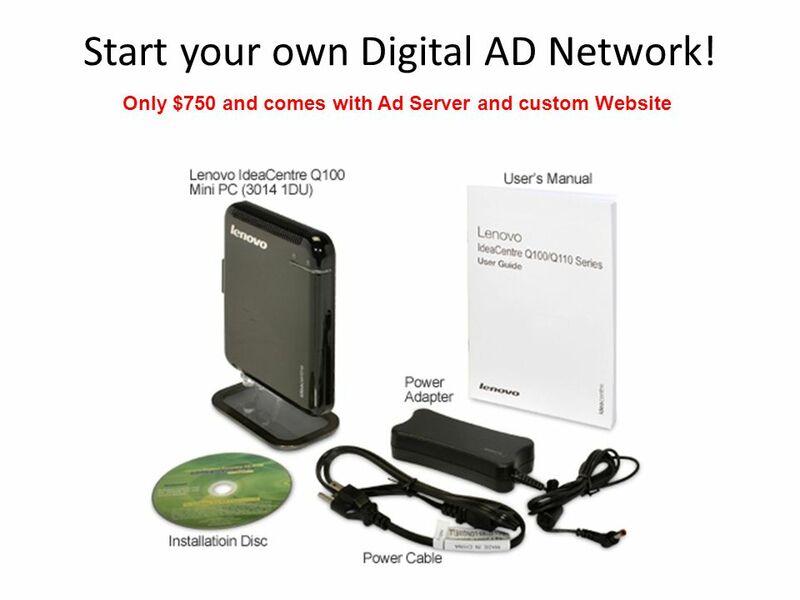 Your Ad Server is pre-programmed and once you have the internet connected your ready to rock and roll. Just power up the display and the Ad Server (micro PC) and in a few minutes ads will start to be displayed every 15 seconds (selectable per ad) in a random fashion. 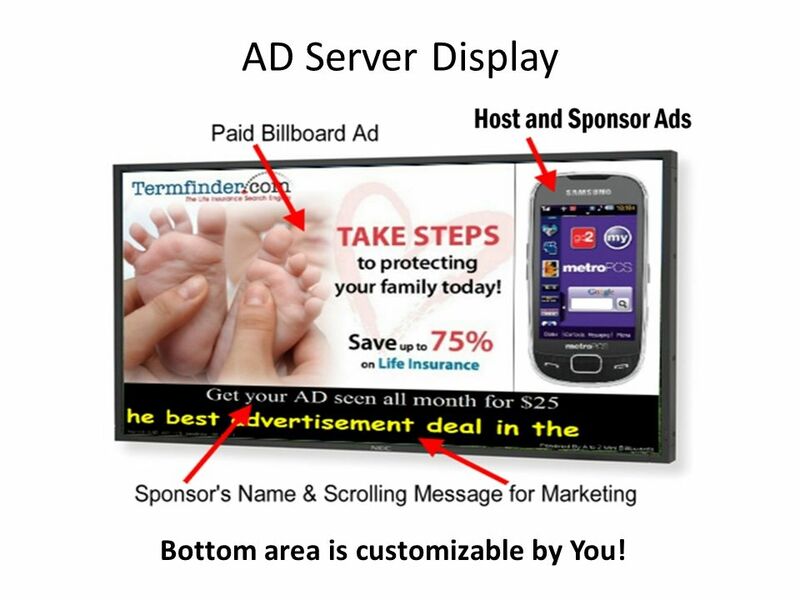 12 AD Server Display Bottom area is customizable by You! 13 Create your ads with a standard image editing program like Photo Shop and save as a 1024 x 615 jpg or get it from your client ready to use. Login to the Ad Control website with your user name and password. 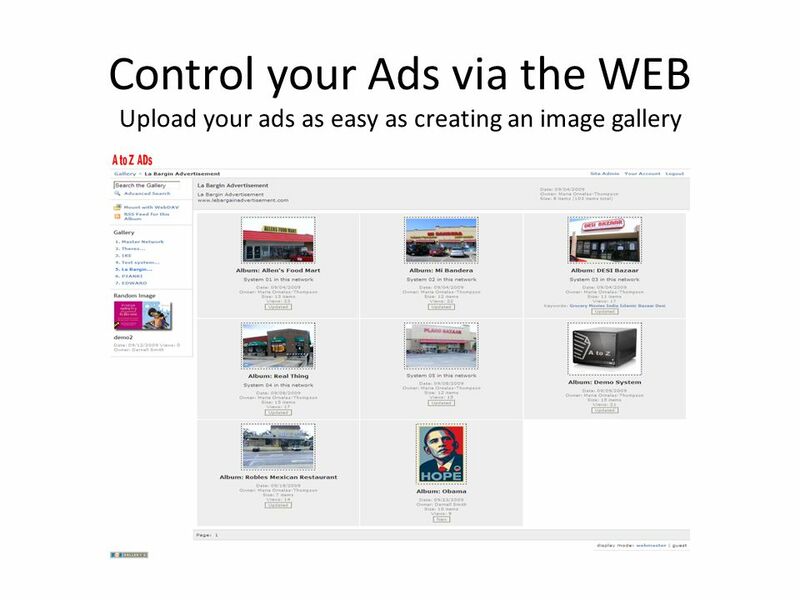 Find your ad album click on your ad server sub album. 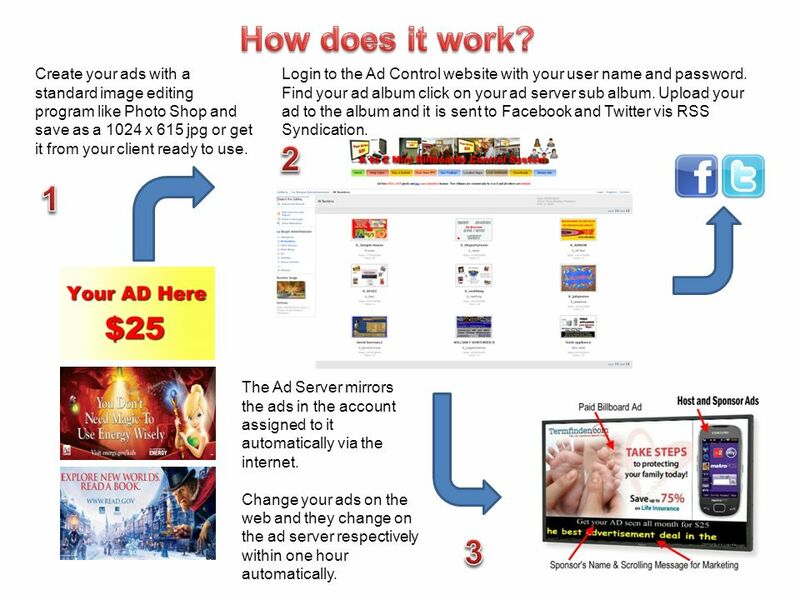 Upload your ad to the album and it is sent to Facebook and Twitter vis RSS Syndication. The Ad Server mirrors the ads in the account assigned to it automatically via the internet. Change your ads on the web and they change on the ad server respectively within one hour automatically. 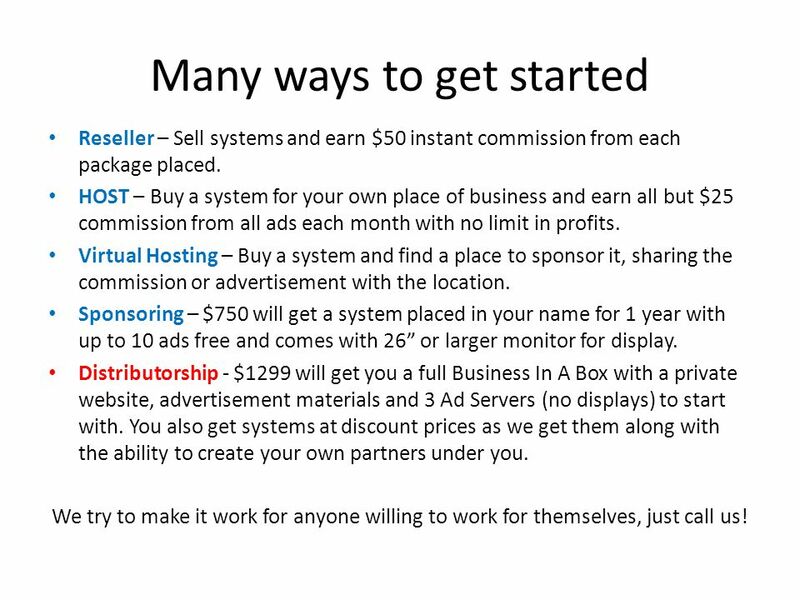 14 Many ways to get started Reseller – Sell systems and earn $50 instant commission from each package placed. HOST – Buy a system for your own place of business and earn all but $25 commission from all ads each month with no limit in profits. Virtual Hosting – Buy a system and find a place to sponsor it, sharing the commission or advertisement with the location. Sponsoring – $750 will get a system placed in your name for 1 year with up to 10 ads free and comes with 26 or larger monitor for display. 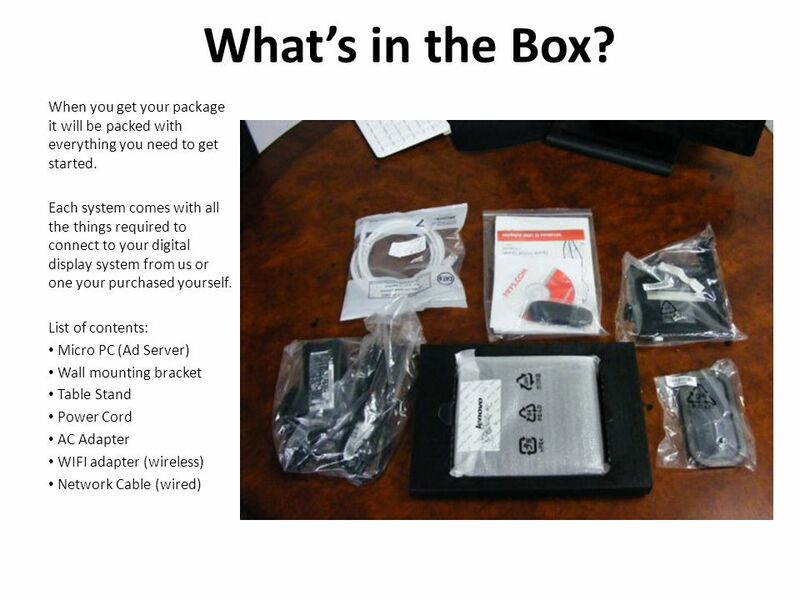 Distributorship - $1299 will get you a full Business In A Box with a private website, advertisement materials and 3 Ad Servers (no displays) to start with. You also get systems at discount prices as we get them along with the ability to create your own partners under you. We try to make it work for anyone willing to work for themselves, just call us! 15 Sponsoring a Mini Billboard System Its only $750 to sponsor a system and this gets you 10 ADs in the system for a duration of 1 year from the time of placement on location. 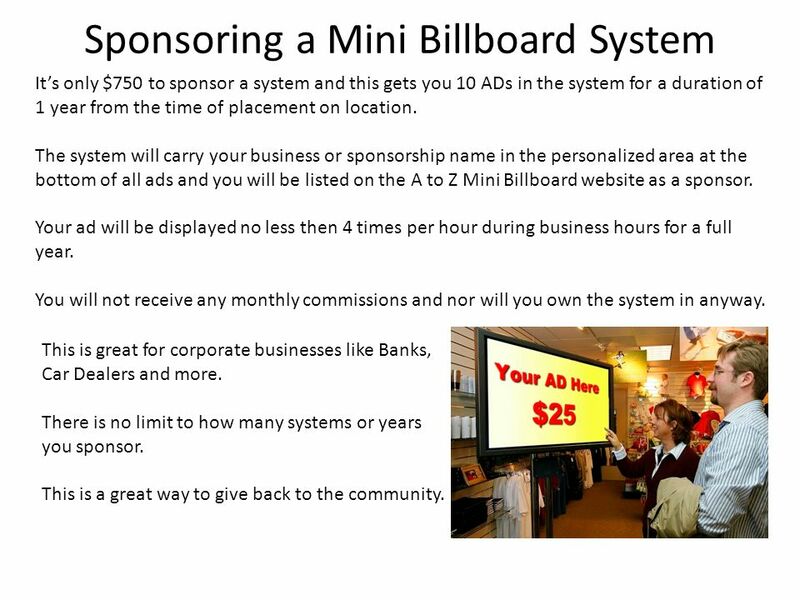 The system will carry your business or sponsorship name in the personalized area at the bottom of all ads and you will be listed on the A to Z Mini Billboard website as a sponsor. 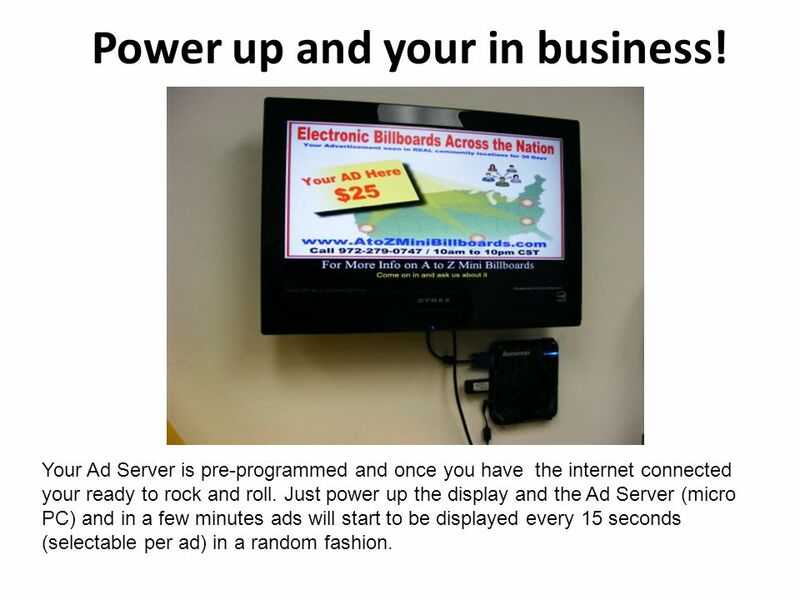 Your ad will be displayed no less then 4 times per hour during business hours for a full year. 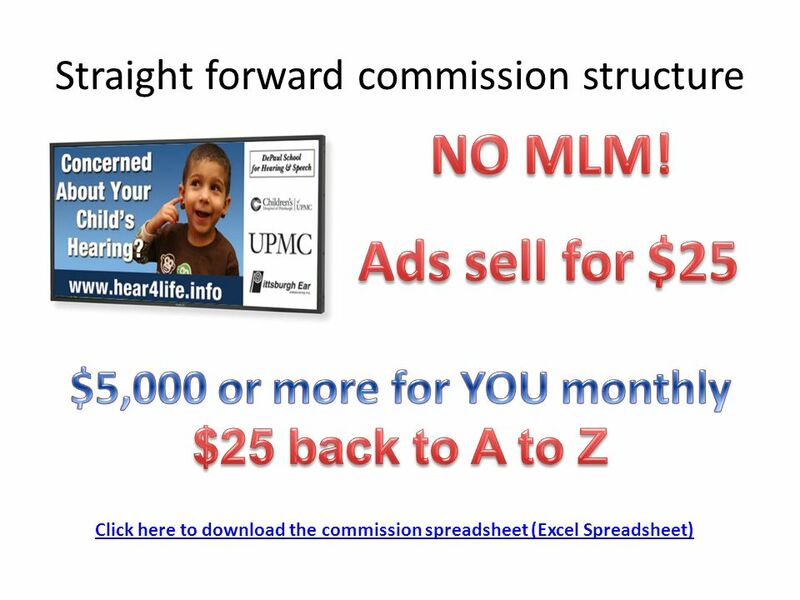 You will not receive any monthly commissions and nor will you own the system in anyway. This is great for corporate businesses like Banks, Car Dealers and more. There is no limit to how many systems or years you sponsor. This is a great way to give back to the community. 16 Hosting and Virtual Hosting The easiest way to start making money with our unique Mini Billboard System is to sign up as Rep and either Host or Virtually Host a system. 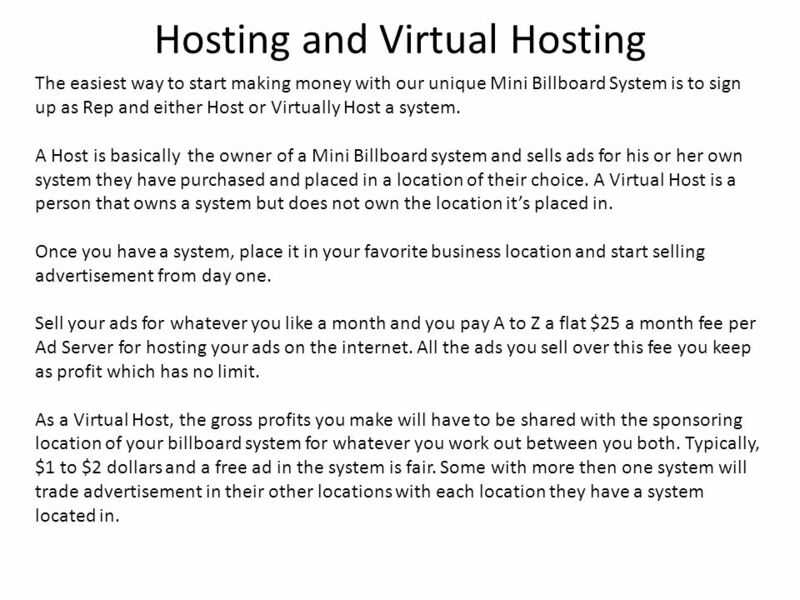 A Host is basically the owner of a Mini Billboard system and sells ads for his or her own system they have purchased and placed in a location of their choice. A Virtual Host is a person that owns a system but does not own the location its placed in. 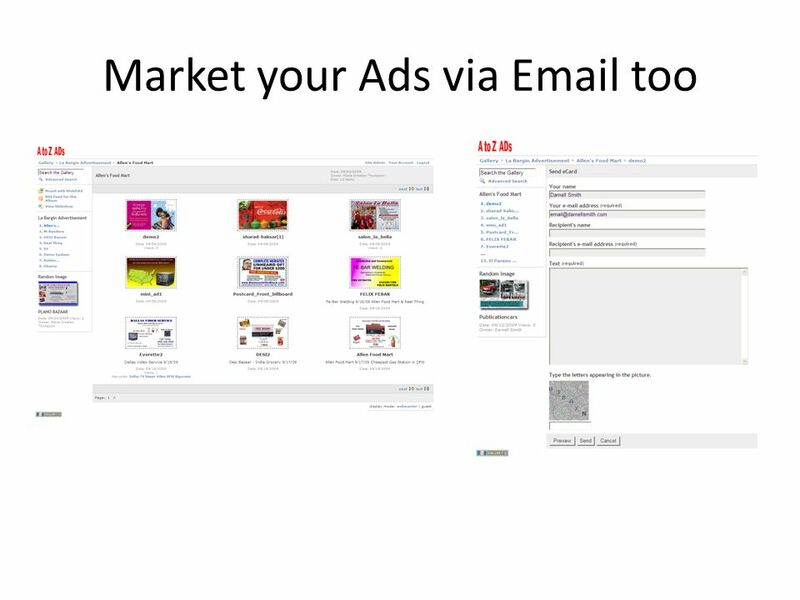 Once you have a system, place it in your favorite business location and start selling advertisement from day one. Sell your ads for whatever you like a month and you pay A to Z a flat $25 a month fee per Ad Server for hosting your ads on the internet. All the ads you sell over this fee you keep as profit which has no limit. As a Virtual Host, the gross profits you make will have to be shared with the sponsoring location of your billboard system for whatever you work out between you both. Typically, $1 to $2 dollars and a free ad in the system is fair. Some with more then one system will trade advertisement in their other locations with each location they have a system located in. 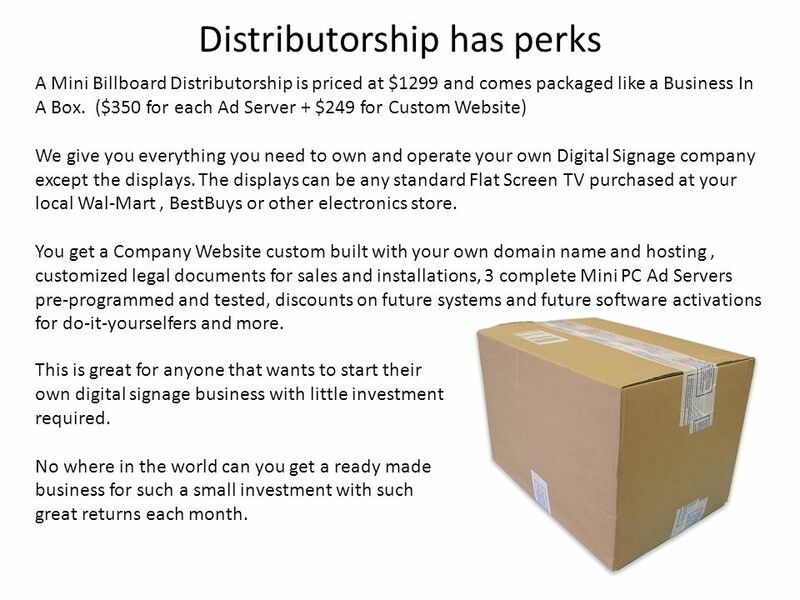 17 Distributorship has perks A Mini Billboard Distributorship is priced at $1299 and comes packaged like a Business In A Box. ($350 for each Ad Server + $249 for Custom Website) We give you everything you need to own and operate your own Digital Signage company except the displays. The displays can be any standard Flat Screen TV purchased at your local Wal-Mart, BestBuys or other electronics store. You get a Company Website custom built with your own domain name and hosting, customized legal documents for sales and installations, 3 complete Mini PC Ad Servers pre-programmed and tested, discounts on future systems and future software activations for do-it-yourselfers and more. 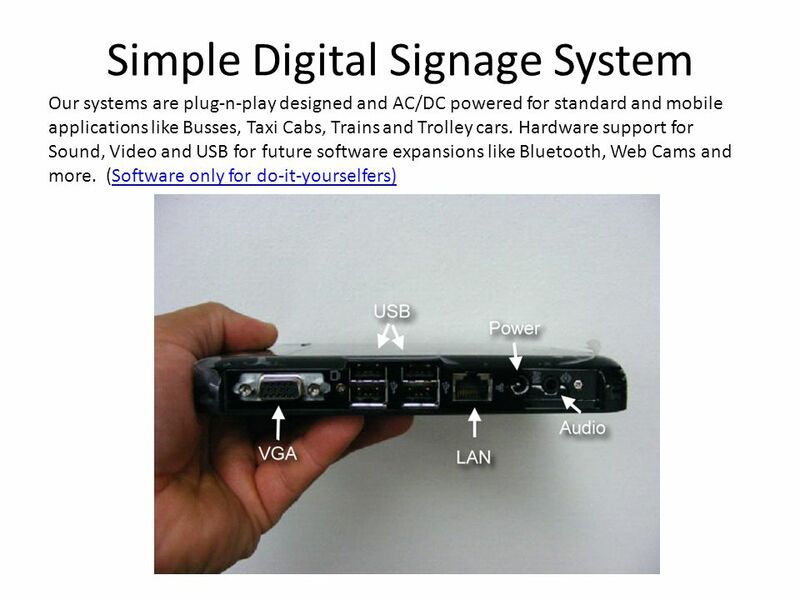 This is great for anyone that wants to start their own digital signage business with little investment required. No where in the world can you get a ready made business for such a small investment with such great returns each month. 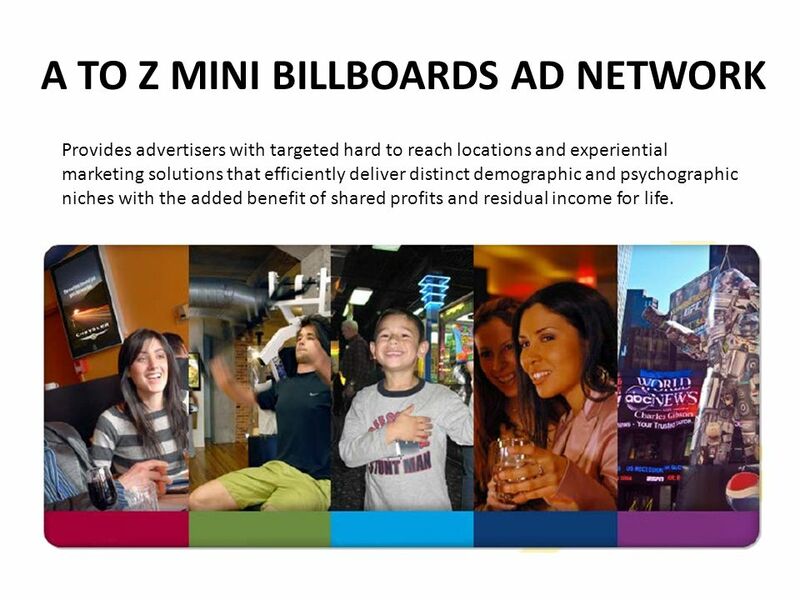 Download ppt "A TO Z MINI BILLBOARDS AD NETWORK Provides advertisers with targeted hard to reach locations and experiential marketing solutions that efficiently deliver." Sync2 Reseller Project Presentation Microsoft Certified Partner and independent software vendor for enterprises and individuals, having Over 12 years of. Welcome to ePaperGallery.com Next Generation Interactive ePaper Mandar Joglekar Founder & CEO MyVishwa. JOIN THE NATIONS LARGEST HOSPITAL GIFT SHOP NETWORK Save on Purchases with PPP… Increase Sales with GiftsofCheer.com. Hotel Link Solutions Sales Training. WHAT, HOW, WHY WHY, HOW, WHAT. MUR-System Next We want with this PowerPoint show how easy it is to install the MUR-Systems hardware. You can try the full version of the software from. MakeMySite: Web Design Professional Website Design. How To Create A Web Page By: Mikeon Briddy & Darrius Jacobs April 10,2006 Mr. Barnett. Dealer Portal Training. Empowering your business  INCREASE sales with IOLO’s no credit check program  EASE of use with IOLO’s automated web application. About Us At PreDealz we put businesses small or large in a position to be successful by designing a marketing and advertising campaign to meet their short. “Consistency is Key!” A Quick Guide to Online Marketing By Virtual Marketing Empire, LLC www.virtualmarketingempire.com.